Perhaps Tom Wheatley loved the table too much. Perhaps if he hadn't loved the table so much, he wouldn't have wrapped it in a protective layer of plastic before placing it in the back of a golf cart for the drive to Shriver Hall, where he was delivering it for use at Freshman Convocation 2006. 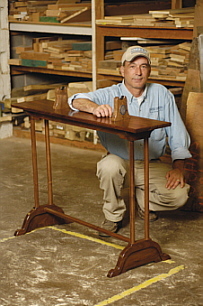 Carpentry shop supervisor Tom Wheatley and his new-and- improved mace table. Photo by Will Kirk Convocation is one of only two events each year, the other being Commencement, at which the table makes an appearance. It has a job on those two days: to hold the university's sterling silver ceremonial mace. It's a delicate table, prone to injury, so the rest of the year, it hangs in Wheatley's office in the basement of Whitehead Hall, suspended from the ceiling so no harm comes to it. It has hung from that ceiling for as long as Wheatley, the university's head carpenter, has been at Johns Hopkins, which is 22 years. 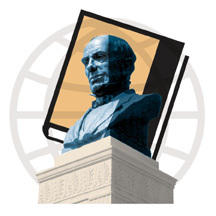 And it hung there for as long as his predecessor, Gerhard Wilke, was at Hopkins, which was about 30 years. Wheatley thinks this table has been around a very long time. But it was raining and windy that September day, the day of Convocation, so he did wrap the table in plastic. And the wind blew the plastic, and the plastic caught the wheel of the cart, pulling the table off the back. "The mace table went flying," he says. "Broke three legs off it a half hour before Convocation." As it happens, Wheatley and the guys at the carpentry shop are old hats at fixing this table. Its legs break pretty much every time it comes down from the ceiling. So they fixed it again, and the table held the mace at Convocation. "It looked like it was taped up with Band-Aids," Wheatley says. "It was kind of embarrassing to put that on stage." Wheatley is a carpenter, but he's a Hopkins carpenter, which means he's also a bit of a historian. He can't replace a shutter on Homewood House with just any shutter. It has to be the exact dimensions, the same kind of wood, and the trim has to be the right cut. If he does have to replace a shutter, he can produce a James Hughes photograph, circa 1899, of the students from Gilman Country School standing in front of that very same shutter. If he has to replace a window, he can sometimes pull out a building's original blueprints, which are housed in a fireproof cabinet in the carpentry shop. And if he has to rebuild a table, he can head down to Biddle Street, where there is a warehouse full of hardwood — birch, ash, maple, chestnut — all harvested at some point from the Homewood campus. For this particular table, though, he didn't go to the warehouse. He went to the shop, which is where the black walnut tree — the one that stood in front of Gilman Hall for who-knows-how-many years — ended up in 2004. It had died, and it had to be removed. Wheatley knows good wood, and he managed to save four or five solid branches. Fought for them, in fact, because the company that brought down the tree wanted to keep the wood. This is the tree he chose when he realized the ceremonial table had seen its last ceremony. Wheatley and the rest of the guys in the shop selected the pieces of wood, planed them, shaped them, routed them, sanded them, and finished them until they had a new table. It was nearly identical to the old one, measuring 10 by 43 by 31 inches, but it had a more solid construction, and the yokes stood a little higher, "to show off the mace better," Wheatley says. Being a historian, and perhaps a bit of a sentimentalist, he researched the tree. And he found photographs, one by A. Aubrey Bodine, and another by Hughes, this one showing Gilman Hall, the walnut tree, and almost nothing else. "The wood of this Presidential Mace table was bequeathed by the very large Black Walnut tree which stood on the Keyser Quadrangle in front of Gilman Hall of the Johns Hopkins University Homewood Campus. "The University supported this tree until its demise in the year of 2004; it can now return the honor by supporting the University at its highest level. "Fabrication, Compliments of the Plant Operations Carpentry Department." Johns Hopkins is used to springtime success in a sport that features a small round ball. And, indeed, at press time, the men's and women's lacrosse teams both had advanced to the second round of the NCAA championship tournaments. But the big story in athletics this season was tennis. Sophomore Brittany Matava Both men's and women's tennis produced their finest seasons ever. The women's team, led by senior Becky Busch, sophomore Brittany Matava, and coach Chuck Willenborg advanced to the second round of the NCAA tournament before narrowly losing to the University of Mary Washington, 5-4. The Jays finished the year ranked 14th in the country, with a 17-4 record, their first Centennial Conference championship, and their first appearance in the NCAA tournament. Five of six starting players return next season, which bodes well for 2008. Willenborg also coaches the men's team, which may make him the most successful single-season coach in school history. The 13th-ranked men made it to the third round of the NCAA championship before falling to Trinity University, 5-1. The Jays had already captured their second Centennial Conference title in the last three years and won a school- record 19 matches, including 15 in a row. They had only three defeats. Freshman David Maldow earned a coveted invitation to the NCAA Division III individual championships after setting a Hopkins record with 18 victories. When Homewood Field opened in 1907, the Johns Hopkins athletes who played on it were not called "Blue Jays." They were called "the Black and Blue" in the News- Letter, the Baltimore press, and nationally. Their nickname derived from their athletic colors, much like the Harvard "Crimson" or Syracuse "Orange." Neil Grauer When, why, and how did the Hopkins teams acquire their avian appellation? Hopkins archivist James Stimpert has theorized that the Blue Jay name stemmed from Hopkins' student humor magazine, The Black and Blue Jay, first published in 1920. (It folded in 1938 but was revived in 1984 and has published sporadically since.) The "Black and Blue" came, of course, from the athletic colors; the "Jay" most likely stood for the "J" in Johns Hopkins. Blue Jays are black-and-blue birds, and they are, shall we say, feisty. Deep delving into microfilm at the Eisenhower Library and Baltimore's Enoch Pratt Free Library seems to confirm Stimpert's deduction — and appears to set the date of the Blue Jays' birth as 1922. The application of "Blue Jays" to the athletic teams wasn't trumpeted. It slipped into print unobtrusively and didn't become the predominant sobriquet for a number of years. Eventually it stuck. 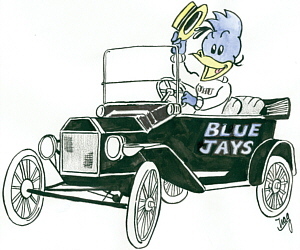 In 1922, two years after The Black and Blue Jay's debut, the press still called Hopkins teams "the Black and Blue" (or sometimes "the Homewooders"), but the association of "Blue Jay" and Hopkins was becoming established in the public mind elsewhere. The News-Letter reported that witticisms from The Black and Blue Jay were being quoted regularly in national magazines. By that spring, journalistic inbreeding on campus may have spawned the athletic Blue Jays. The editor in chief of the News-Letter was the advertising manager for The Black and Blue Jay, and the editor in chief of The Black and Blue Jay was a junior editor of the News-Letter. On March 31, 1922, the News- Letter made what may have been its first reference to Hopkins athletes as "the Blue Jays" in a story on the swim team. Initially dubbing its members "the Black and Blue natators," the anonymous writer then called them "the Blue Jays." The "bird of gorgeous plumage pranced tirelessly about the field and proved an omen of good fortune for its possessors," according to The Sun. Although "the Black and Blue" remained the standard designation for Hopkins athletes, occasional references to "the Blue Jays" began popping up the following year in the News-Letter and Baltimore's dailies, including the News, the American, The Sun, and The Evening Sun. On November 29, 1923, at a Thanksgiving Day football game against Maryland, the Hopkins Blue Jay burst forth figuratively and literally. The game was held in the old Baltimore Stadium, later the site of Memorial Stadium. The Maryland team — rarely called "the Terrapins" then but sometimes "the Farmers" because of the school's origins as the Maryland Agricultural College — brought "a lumbering farm horse" and a mule onto the field as its mascots, reported The Sun the next day. That was when the Blue Jay made its "first public appearance" in the form of a costumed student, according to the paper. The "bird of gorgeous plumage pranced tirelessly about the field and proved an omen of good fortune for its possessors," according to The Sun. The Evening Sun provided more detail, describing the Blue Jay as having "yellow legs, huge feet, black tights, and a blue body and wings." "The first skirmish of the afternoon was a decided victory for Hopkins," the paper continued. "The two [Maryland] horsemen tried to scare the jay, but that giddy bird didn't scare worth 2 cents. Flapping his wings, he advanced upon the horsemen, and the horses turned tail and ran terrified." The less physically imposing Hopkins team fought Maryland to a 6-6 tie — an unqualified moral victory. Maryland was "Played to a Standstill by Blue Jay Machine," blared a Washington Post headline. Construction recently began on a new 12-story tower at Johns Hopkins Hospital. One of them, designated for cardiovascular and critical care, will be paid for in significant part by a new major gift from His Highness Sheikh Khalifa bin Zayed Al Nahyan, president of the United Arab Emirates (UAE). The amount of the gift has not been disclosed, but the adjectives used by Hopkins officials have included "transformational" and "magnificent." Announced in April, the gift mostly will be used for construction of the 913,000-square-foot tower. A portion will support the School of Medicine's Dean's Discretionary Fund, as well as AIDS research at the Johns Hopkins University-Makerere University Collaborative Care Center in Kampala, Uganda. Sheikh Khalifa made the gift in memory of his late father, who established the United Arab Emirates and served as its president from 1971 until his death in 2004. The new tower, to be named the Sheik Zayed bin Sultan Al Nahyan Cardiovascular and Critical Care Tower, will house the Johns Hopkins Heart Institute, with 355 patient beds, operating rooms, catheterization labs, and imaging suites. The facilities are "designed to marry the needs of a teaching hospital with the latest in communication and information technology," according to a Johns Hopkins Medicine announcement. "We can only imagine some of the advances that will occur within this building, and we look forward to the near future, when work on the building is finished, and work in the building begins," Johns Hopkins Medicine CEO Edward D. Miller stated in the announcement. Construction is expected to be completed in 2010. Salmah Y. Rizvi has big plans. The 20-year-old Johns Hopkins international relations and anthropology major, who just completed her junior year, wants to effect change in a number of issues, such as human trafficking, child soldiers in Africa, and the lack of understanding among U.S. policy-makers regarding the culture of Muslims in the Middle East. Truman Scholars present and past: Salmah Y. Rizvi (left) and Sarah David were recognized for their commitment to public service. Photo by Will Kirk Rizvi recently got some help with those plans: She was named a Truman Scholar in March. The $30,000 scholarship is awarded annually to a select number of outstanding college juniors nationally who aspire to careers in public service. The Laurel, Maryland, native has traveled to Uganda and Iceland as a student ambassador promoting peace and teaching international humanitarian law. As a sophomore she co-founded VisionXchange, a Homewood-based student group that hosts fun events to raise money for causes like the Measles Initiative and charities that help survivors of a recent earthquake in Pakistan. She has served on the Johns Hopkins Diversity Leadership Council, interned for the Muslim Public Affairs Council, and teaches Islamic history every Sunday at her mosque, Idara-E-Jaferia Center in Burtonsville, Maryland. "There are so many issues in so many countries that we as Americans can help," says Rizvi. "I'm blessed, and I want to work to help make sure that other people who are less fortunate can get on equal footing one day." John Bader, associate dean for academic programs and advising, praised Rizvi for her dedication, commitment, and energy. "A Truman Scholar is somebody who has committed themselves in a variety of different ways to the same cause," he says. "In Salmah's case, this is the reconciliation between Muslim Americans and the broader population. She believes that dialogue about this is critical to our future, so she has done many things to foster that, from her mentoring of young people to her scholarship on better understanding the politics of Islam to going to and organizing conferences." Rizvi, who says she would like to become a diplomat for the U.S. government and work in the Middle East, is one of 65 students nationwide to be named a Truman Scholar this year and one of only 10 Hopkins students so honored since the Trumans were first awarded in 1977. Congress established the scholarship foundation as a memorial to President Harry S. Truman in 1975. In addition to receiving scholarship money, Truman Scholars are invited to attend Truman Scholar Leadership Week, where they receive leadership training and advice on graduate school and careers. The summer after they receive the scholarship, students have the opportunity to intern for the federal government. "What the Truman does is not only recognize people who are making a commitment to public service. It also fosters a community of those people," says Sarah David, a just-graduated 2006 Truman Scholar. And then there are the contacts. David, who is joining Hopkins' governing board as a young trustee on July 1, will spend the summer interning in the counterterrorism office at the U.S. State Department — an experience made possible by the scholarship. "Of course anyone can choose a career in public service," David says. "But the community the Truman Scholarship fosters helps facilitate the means to be the most effective leaders we can be." On May 24, Johns Hopkins University officials announced that Ellen Frishberg had resigned as director of student financial services for the Homewood campus. An investigation by New York Attorney General Andrew M. Cuomo into the lending practices of several colleges and universities nationwide found that Frishberg had received $65,000 in tuition and consulting fees from Student Loan Express (SLX), a company included on some of the university's lists of suggested lenders. Through its own investigation, the university has concluded that, though officials knew Frishberg had served on an SLX advisory board and had been reimbursed for expenses by SLX, there was no evidence that any official knew of the consulting and tuition payments. Hopkins determined that Frishberg's failure to submit written reports about the payments went against the university's ethics and conflict-of-interest policies. It also found that no student or parent was financially harmed because of Frishberg's relationship with SLX. When a small airplane smashed into a Manhattan apartment building last October, the pilot, Cory Lidle, died. Lidle was a pitcher for the New York Yankees, so the crash generated more news coverage than usual and prompted the editors of the Journal of the American Medical Association to ask Johns Hopkins aviation-safety experts to write a commentary on the risk of flying small planes. What the researchers found was that the fatal-crash rate for general aviation is 82 times the rate for commercial aviation. Guohua Li and Susan P. Baker, both professors in the Bloomberg School of Public Health and the School of Medicine, reported that from 2002 to 2005, 91 percent of all aviation crashes in the United States occurred in general aviation; that is, non-commercial flying such as recreational and business aviation, emergency medical services, flight training, crop dusting, search and rescue, aerial surveying, etc. For aviation fatalities, the figure was 94 percent. From 1986 to 2005, commercial airline crashes that resulted in deaths declined from 16 percent to 6 percent. During the same period, the percentage for general aviation crashes that involve fatalities remained at about 19 percent. "What surprised us was the increasing gap between the safety records of commercial and general aviation," says Li. "The safety record of commercial aviation [in the United States] continues to improve. It has almost approached a kind of zero limit — there's very little room for further improvement. But if you look at the safety record of general aviation in the past 20 years, there isn't much improvement." In the United States, approximately 228,000 people fly as licensed private pilots; about 220,000 registered general aviation aircraft are in current service. Li and Baker listed several reasons why those pilots and aircraft are at greater risk for accidents. Smaller planes fly much closer to the ground, which makes them more vulnerable to bad weather or low visibility. Private pilots frequently have less training and less experience than commercial pilots; when conditions deteriorate, they often are less able to fly out of trouble, especially if they have to rely on instruments rather than visual flight cues. Compared to commercial airliners, small planes frequently have less safety equipment such as state-of-the-art passenger restraints and emergency evacuation systems. 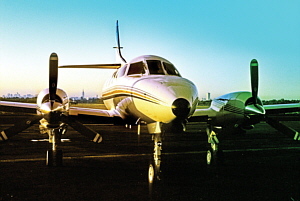 General aviation planes tend to stay in service longer than automobiles, with 20- or 30-year-old aircraft commonly in regular use. But federal safety regulations mandate the latest safety technology only on entirely new aircraft models. This loophole means that neither aircraft manufacturers nor owners are now required by law to upgrade the safety features of existing models or planes built before current regulations. 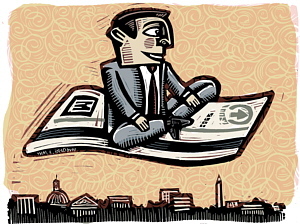 In 2004, David Mortlock, SAIS '07, was fresh out of the U.S. Marine Corps and on a job interview in Washington, D.C., when his interviewer told him that one of the benefits of working at his company was that employees received free monthly Metro fare cards to com-mute to work. The interviewer, who com-muted via carpool, confessed that he never used them. William L. Brown "It seemed like such a waste — he must have had $1,200 in unused fare cards in his desk drawer," says Mortlock. "I thought, 'Someone could really use that.'" He knew from volunteering at an area shelter that a lack of transportation often prevented home-less people from getting and keeping jobs. And he knew he wanted to help fellow veterans. So Mortlock founded FareShare (www.faresharedc.org), a nonprofit all-volunteer effort that turns leftover Metro fare cards into $100 SmartTrip cards that are given to veterans in the Washington, D.C., area to travel to job interviews and to work. Metro riders drop their unused fare cards into any of the 30 FareShare boxes located at the front desks of partici-pating D.C.-area hotels and at Reagan National Airport. The cards are consolidated into SmartTrip cards and given to caseworkers at Ignatia House and All Faith Consortium, two Washington-area organizations that assist homeless veterans. "Veterans make up between 25 and 30 percent of the homeless population — that's huge," says Mortlock, who served four years in the Marines, including six months in Iraq. "Imagine being trapped in the house with no way to get around the city and no way to get to a job. Even if you get an interview, if you don't have any money to get there, you can't go. It's a vicious cycle." The amount on individual unused Metro cards — which can't be redeemed for cash — ranges from five cents to $30. Alone they don't amount to much, but together they add up. To date, the group has collected about $45,000 in Metro fares to help homeless veterans. FareShare has doubled its number of collection boxes in the last six months, and the group hopes to reach out to even more veterans in the future. Mortlock graduated last month with a joint degree from Johns Hopkins' Nitze School of Advanced International Studies and the University of Pennsylvania's Wharton Business School. Even though he is moving to San Francisco this summer to work as a consultant for Bain and Company, he's staying on as president of FareShare. When Joseph F. Young auditioned in Memphis last December, he didn't think he'd done very well. He was trying to win an American Symphony Orchestra League (ASOL) conducting fellowship. "I'm usually very comfortable on the podium," he says, "but this time it felt like there was some pushing and pulling [with the musicians] that wasn't very natural for me." What he didn't know was that in the audience were staff members from the Baltimore Symphony Orchestra (BSO), and apparently they were more impressed. Shortly after his uncomfortable experience, he received an invitation to audition last March to be the first BSO-Peabody Conducting Fellow. Not much later, he learned that he'd won. Stockbyte/Getty Images The 24-year-old high school band director from South Carolina will arrive in September to begin a two-year stint working with Marin Alsop, the BSO's music director, and attending classes at Peabody Conservatory and Homewood. The new program, supported by seed money from the ASOL, means to provide training and experience for young musicians who have graduated from college but are not yet launched on conducting careers. Young will intern with Alsop, working with the orchestra, sitting in at rehearsals, and conducting a few community outreach concerts. 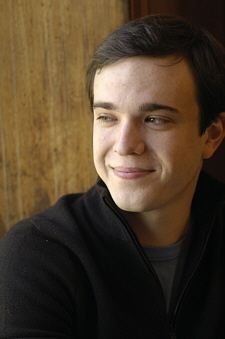 At Peabody, he will take classes and study conducting with Gustav Meier, director of Peabody's conducting program. He will be on full scholarship at Peabody and also receive a stipend. Young, raised in Charleston, South Carolina, first conducted a student orchestra when he was 16, while attending the Governor's School of South Carolina, a summer institute for gifted high school students. 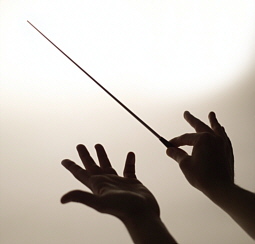 He led the orchestra in a movement from a Beethoven symphony and was hooked. "That has stuck with me," he says. After graduating from the University of South Carolina, he became band director at D.W. Daniel High School. Last summer, he won a spot in a master class taught by Alsop at the Cabrillo Festival of Contemporary Music in Santa Cruz, California. "She was very personable and professional at the same time, which is hard to find with some conductors," Young recalls. After the festival, they stayed in contact through e-mail, and she recommended him for the ASOL fellowship, the one he didn't get that set him up for the one he did. When Max Sindell, A&S '07, was about 8 years old, he flew alone for the second time. It was exciting. It was harrowing. His mother was distraught. Sindell was on his way to visit his father in Aspen, Colorado, when a ferocious blizzard struck the Rocky Mountain State. After a series of delays and cancellations, diversion to a backwater called Rifle, and eventual resignation to ground- based transportation, Sindell finally made Aspen. The experience, he says, taught him a lesson: It was time to grow up. Max Sindell sees his parents' divorce as "a problem that I got to solve." Photo by Will Kirk Sindell's parents divorced when he was 6. His mother remarried once; his father twice. Many children embroiled in the tumult of a parental split succumb to depression. They become, in Sindell's words, "hopeless waifs." But the 21-year-old Sindell, who graduated from the Writing Seminars this spring, took a different approach to his role as a son of marital fallout. "It was a problem that I got to solve," he says. Come August, those solutions will be available in a slender handbook titled The Bright Side, published by Health Communications Inc., the publisher best known for the Chicken Soup for the Soul anthologies. The Bright Side will be a guide for children ages 8-14, dispensing advice on everything from the aforementioned travel woes to effective communication with parents, living in more than one house, dealing with step and half relations, and that touchiest of subjects — parental dating. "Your parents start dating, and that's really weird because maybe you're in middle school, and you don't even know what dating is," he says. "And now you've got these new men or new women, or both, coming into your households." Sindell offers steps children can take to establish a modicum of control over their lives. Some hints, like remembering to keep daily necessities such as toiletries or school supplies in multiple houses, are practical. Others, like his suggestion that children avoid discussing the intimate details of one parent's life with the other, clearly emerge from incidents in his past. By taking responsibility at a young age, children can prevent an upbringing that might otherwise be shocked by vitriol and prodigious bouts of tears, he says. In his 2003 Oscar-nominated documentary, Spellbound, director Jeffrey Blitz, A&S '90, '91 (MA), showed audiences how spelling bees symbolize the American dream, and captured some pretty funny footage of nerdy middle school kids. 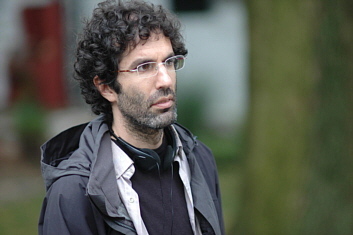 His second film, Rocket Science, which recently screened at the 2007 Sundance festival, won Blitz an award for best director of a dramatic film. A comedy about a high school student with a bad stutter who joins his school's debate team to win a girl's affections, Rocket Science is due in theaters in August. JHM: If spelling bees are about the American dream, what are high school debates about? JB: High school debating, as set out in Rocket Science, is about mastery of the world around you. To be able to argue for something, to best another team by putting forward a more compelling vision, is shorthand for gaining control, or the illusion of control. Hal Hefner, the main kid in my movie, has no mastery of anything important: His family is coming apart, he's smitten with a girl who doesn't love him back, and he can't get on top of his halting speech. He's just a luckless little chump. In his fantasy, debate will be a realm for him to finally and spectacularly succeed at something. JHM: What drew you to the story in Rocket Science? JB: I got to write deadpan funny. It was the first writing project where the voice began to reflect my own sense of humor. I was pretty cautious about writing a coming-of-age story, and it was only when I set out to shade it quirky and dark and funny that I started to feel I could really get behind it. JHM: Why were you cautious about writing a coming-of-age story? JB: I was really trying hard not to make a movie where there were lessons learned. That kind of formula — little guy takes his lumps but wins the girl in the end — feels distinctly unlike life. It's not that there aren't victories in reality because there are, sometimes great ones, but they're always more complex than simple, and the lessons aren't easy-to-digest ones. JHM: So Hal stutters, and you stutter. Is that where the similarities between you and your main character end? JB: I must have had a period in my adolescence where I imagined myself as the kind of sad-sack dork that Hal is, but I don't remember it. We do share lots of concrete attributes: We stutter, we debate, we rely on some acid sarcasm to fend off the encroaching world. But Hal's much more of a sweet victim than I ever was. Late in the movie he discovers a bit of the fire that I think I've probably always cooked with. JHM: How different is it making a feature versus a documentary? JB: It's actually very similar. In both cases, you're constantly rewriting the story as you first imagined it. In Spellbound, I had a clear idea of how most of the kids' stories would play out before we started shooting. Of course, once we actually began filming, I had to revise all my ideas every day. That process is exactly the same in fiction features. I have a certain specific idea of the story in my head when I start prepping. My lead actor will look a certain way; he'll deliver these lines with a particular cadence; the house he lives in will be a specific color. And then reality hits. You're constantly reconstructing the story in your head, to let go of your original idea while still fighting to maintain whatever elusive thing it was that made that story compelling in the first place. JHM: What makes you laugh out loud in a movie theater? JB: I don't ever think about comedy in theoretical terms or in formulaic ones so I don't know the answer to this. When something lands funny, it lands funny, you know? I try not to get too deep into it because comedy really is best when its gears are all moving under the surface. I will say, however, that a great pratfall almost always gets me.